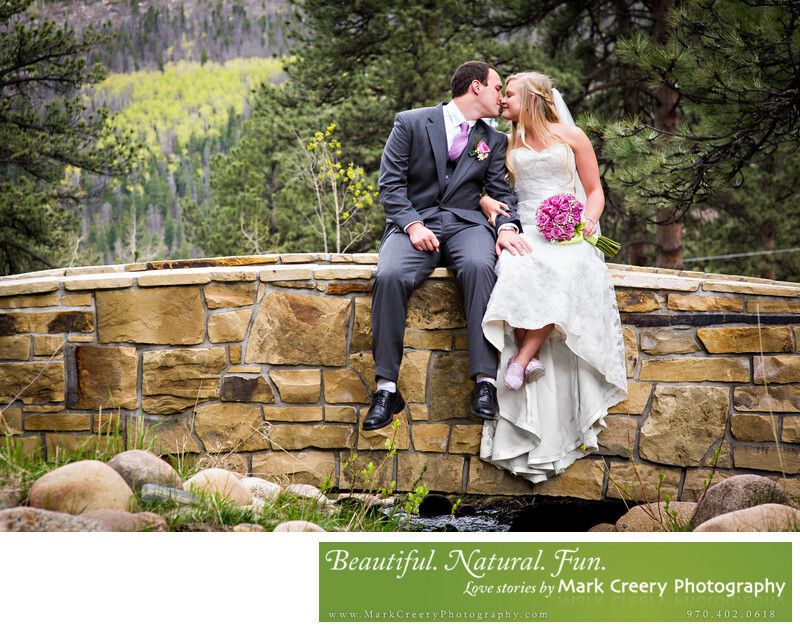 In this photo, the bride and groom steal a kiss on a bridge at Della Terra. I enjoy looking for fun and different ways to capture couple portraits, and take advantage of architectural features available at the venue itself. Here the bridge stood out, but instead of doing the more standard approach of standing behind the stone, I asked if they were up for sitting on the top. This leads to a more casual and whimsical feeling that makes the kiss seem more playful. I love how the bride's feet are crossed and getting a glimpse at her casual footwear. I love photographing mountain weddings, and Della Terra is one of my favorites anywhere in the Rockies! Della Terra Mountain Chateau is located in Estes Park, Colorado. Contact: (970) 586-2501, weddings@dellaterramountainchateau.com. Location: 3501 Fall River Rd, Estes Park, CO 80517.